Can you confirm these amateur observations of Ditaxodon taeniatus? Distribution S Brazil (Rio Grande do Sul, Paraná [HR 27: 216], Mato Grosso do Sul, São Paulo), Peru ? ; elevation between 800 and 1000 m in the state of Paraná and about 1800 m in the state of São Paulo. 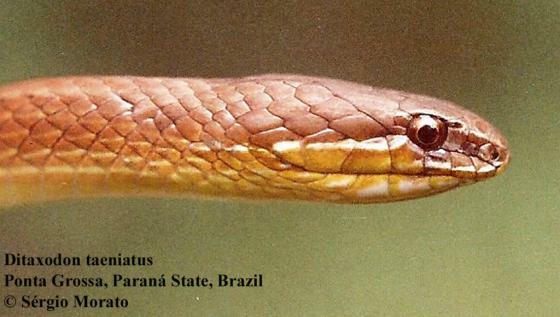 Type locality: Palmeira (25°20’S, 50°00’W, 860 m), state of Pará, Brazil (neotype; see type information). Comment Measurements: 543 mm TL, tail 122 mm; tail/TL 0.225 (neotype). The original type locality, “Porto Alegre”, is dubious to Bérnils et al. (2006). Not in Peru according to these authors. 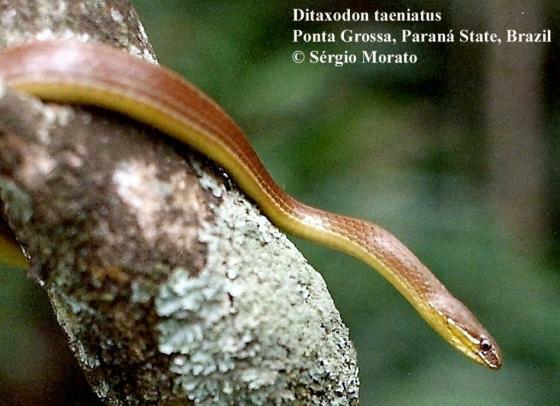 Type species: Philodryas taeniatus PETERS in HENSEL 1868: 331 is the type species of the genus Ditaxodon HOGE 1958.